Ok, confession time. This photo was actually extracted from a 4k video we created for Milton Keynes council. Why is that relevant? Well at the time our brief was to create a video for Milton Keynes Council, so our drone was set up for video, not photography. Secondly, it shows just how far video has come in the last few years where you can extract a very, very good still image from original 4k video content. This is great news! 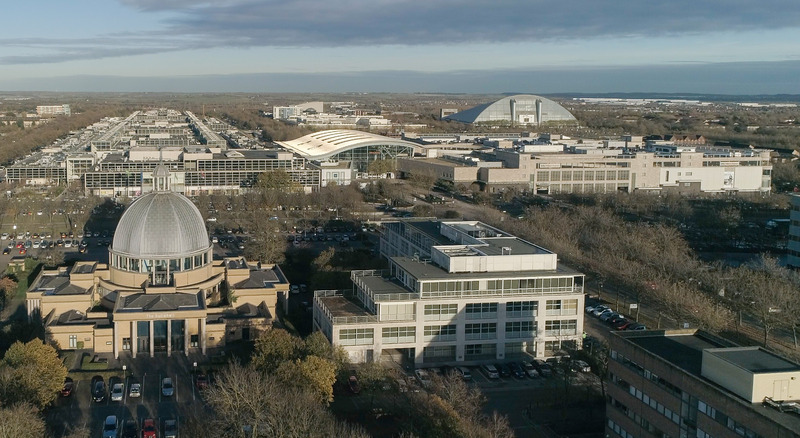 Don’t get me wrong, if my brief was to take a photo of the MK City then I would of had my drone set up for exactly that, as a photo will always have more dynamic range than a still taken from a video. However, if the still you require from a video is simply to print up to no more than around 20 inches wide or to use it for promotional means on the web, then taking a still from 4k video is completely justified. In fact it makes sense as it means you can go through your video footage and get some great still photos! This has all been possible by 4k cameras now becoming standard, certainly on drones. 4k gives us enough resolution to play with to get a decent still, where as in HD the photo might of looked a bit “soft”. In order to get this shot we had to be 50 meters from buildings and people and with a little help from the council (to take off from their land) and from bing maps to check distances, we managed just that. In post production we were also able to “crop in” to the photo and bring the foreground closer to the viewer. We also kept the white balance to slightly warmer than usual, just to bring out the nice colour of the sun that was hitting the city. They say video and photography is all in the planning and this shot of Milton Keynes City Centre took exactly that. We think it was well worth it so people can get a view of this modern city from the sky.